Many of us have fond memories of times spent at Broomfield House in the past. We recall the museum exhibits, the Lanscroon murals, and enjoying tea with our friends at the café. Sadly, others have only seen the House enclosed in scaffolding, as it has remained since it was destroyed by fires over 20 years ago. Finding the substantial capital required to restore the House in the current climate is not an easy task. We are pleased to report however, that there is a renewed effort to do so. Enfield Council, together with members of The Broomfield House Trust and Friends of Broomfield Park are working on a proposal to try to secure financial support from the UK Heritage Lottery Fund to restore the House for community purposes. The intent is to submit a proposal to the Parks for People Lottery Fund at a later date to revitalise the Stable Yard and Baroque Gardens. Additional funding will also be needed from other sources to ensure the viability of the project. The intent is to restore the House as faithfully as possible to its nineteenth century appearance, without the mock Tudor facade which was added in the 1930s. 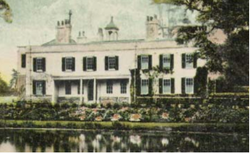 The picture above is from a 1903 postcard and is a good illustration of what the restored house would look like. View the full article which gives an overview of some of the ideas under consideration. View the slides presented at the Open Meeting in September 2012. November 2012 Update: the Stage 1 bid to the Heritage Lottery Fund has now been submitted by LBE – a formal reply should be received in January 2013 as per the stages below.